I'm getting a dab hand at cooking in my small oven… I was able to add some protein to the diet today…..!!!!! 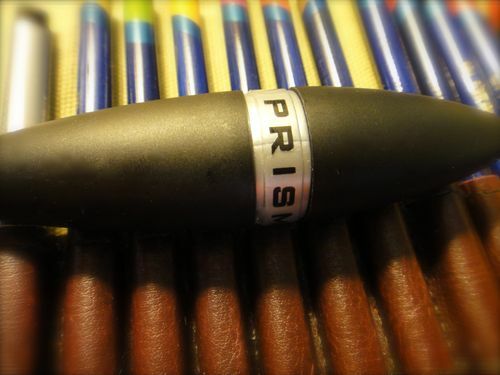 This is a photo of the prisma pencil sharpener I mentioned in the last post… It works well, and doesn't chew the pencils….this one travels with me, I got one for my buddy and I will take one home. 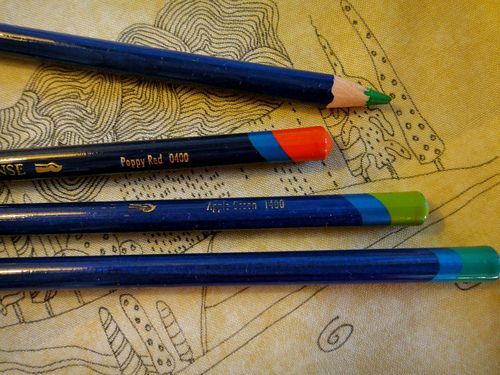 I'm rather fussy about the way my pencils work and as I mentioned I'm taking the ones I purchased yesterday back to Hobby Lobby. I'm using "Ink tense" (pigment ink pencils) on this piece. 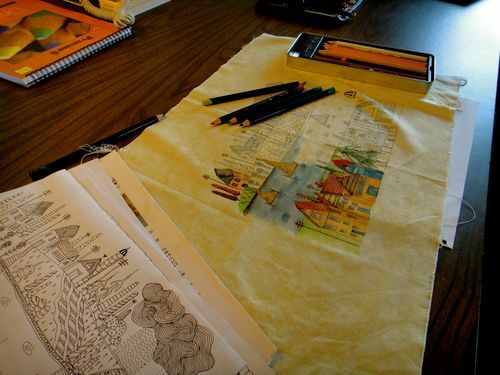 Now some quilters, create the image with quilting first and then almost 'paint' the pencils on…. I prefer to do it differently. 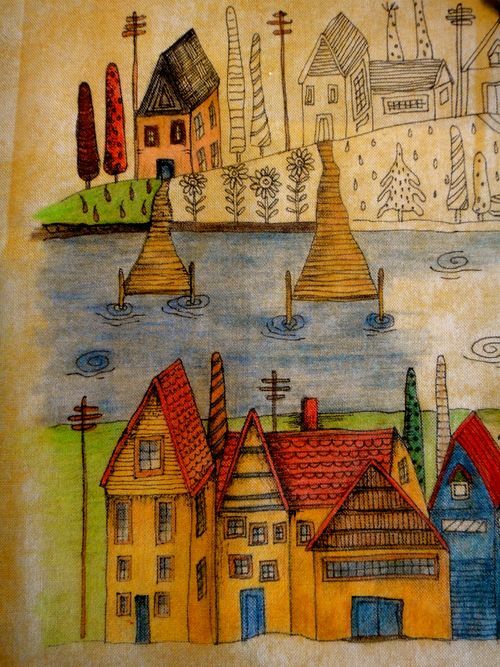 In this picture, I colored the image with the pencils and then wet it with a tiny brush to produce the applique. 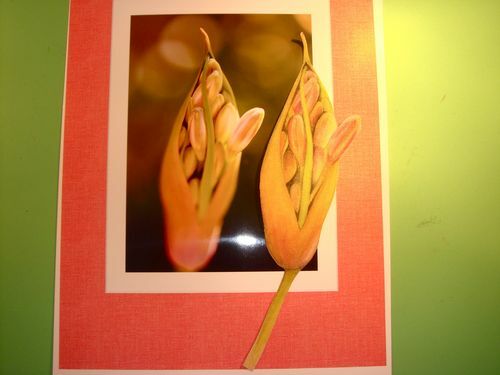 The photo is behind and the applique in front…it's not bright and garish, but realistic. I traced my drawing of Minnesota onto the fabric, a tight weave fabric. I didn't wash it prior to use…I need the sizing in the fabric to assist the smooth flow of the pencil. OK, I'm off to check out the quilts stores in the area and then work all afternoon on the book…. 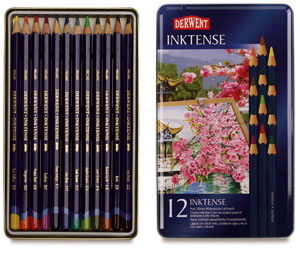 Tagged with: illustrating on fabric., Ink tense pencils by derwent. fact and fiction. Wow Pam. I always feel so sorry for you when you are a world away from home and for so long. But, by the looks of it, at the moment, you aren’t tenting in the back forty. Quite “posh” and cozy. Your current piece is wonderful.